Powerhouse performer/activist Alexandra Billings, five-time winner of Gay Chicago Magazine’s esteemed After Dark Theater Award, and 2009 Grand Marshal of Chicago’s Pride Parade, will play the Loring Theater with show tunes and hilarious observations that you simply cannot miss. 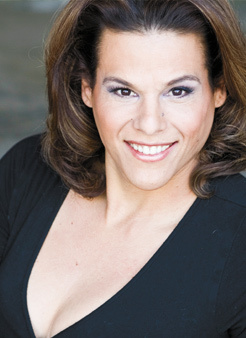 Billings was the first transgender actor to play a transgender character on American TV. Though she has now had her fill of playing trans hospital patients on their way to death, her episodes on ER, Grey’s Anatomy, and Nurses are still groundbreakers. She was the subject of the Emmy-nominated PBS documentary From Schoolboy to Showgirl. Her uproarious observations appear in the terrific Minneapolis indie film FAUX. I spoke with Billings recently by phone. She was in Los Angeles, where she lives with her wife, Chrisanne Blankenship. When I saw FAUX, the crowd roared during your comments about how gay marriage would spur the economy. What are your thoughts about the queer community as a potentially powerful economic force? If every gay person in the United States of America made a vow: Do not spend any money—and I mean a dime—at any business that was not gay-owned or gay-run, the United States of America would shut down. It would cease to exist. We’re not going to do that, because we can’t get together in one big room and agree. But we have to stop looking outside our own community. And what we have to do as individuals is start speaking our truth. I mean: Come out of the closet! One of the ways that we can help our brothers and sisters do that is by extending a hand to the other side. And here’s what I mean: When the extremists come toward us, instead of throwing slurs or tossing rocks, what we need to do is extend a hand. I’m your neighbor. I’m your grocer. I live next door to you. Let me introduce myself to you. Yet some of us play victim. We need to put the victim thing aside. We not only need to put it aside, we need to call each other on each other’s crap. I’m approaching 50. In the ’70s, we were still hiding, steeped in shame, and our generation still holds that. I’m guilty of that. So, we really need to look to that new generation. These kids with their iPods and the Internet—they’re smarter than us. They’re more eloquent. The only thing they lack is the human experience. They spend so much time with machines, texting and one thing or another, that they lack a lot of human touch. What they need to do is get in touch—and I mean physically and emotionally—with their own people. And I hope our generation will erase and relinquish and shed so much of our shame.